You’d think NASA’s Mars Reconnaissance Orbiter (MRO) has seen everything there is to see on the Martian surface in the 11 years it’s orbited our nearest neighbour, but a snapshot taken over the planet’s South Pole has revealed something we can’t explain. While the planet’s entire surface is pocked with various depressions and craters, a vast pit spotted among the “Swiss cheese terrain” of melting frozen carbon dioxide appears to be a bit deeper than your average hole, leaving astronomers to try and figure out what made it. A lot of things can make holes in Mars’ rocky terrain: more than half a million meteorite impacts have left craters; collapsing lava tubes have created deep pits; ancient floods have gouged out giant chasms; and volcanic activity has melted ice to leave funnels. Occasionally the MRO will come across an odd feature that poses a fun mystery to solve, such as this shallow, circular depression seen earlier this year. Being summer for Mars’ South Pole, the Sun is low enough in the sky to accentuate shadows over the landscape, making subtle features pop right out. Yet there a glint of light is still able to reveal ice at the bottom of the hole. Surrounding the pit are patches frozen carbon dioxide. The circles in the ice is thought to where the dry ice has sublimated into gas in the summer sunshine, leaving what astronomers call “Swiss Cheese terrain“. The image was taken using the MRO’s High Resolution Imaging Science Experiment, or HiRISE camera, which allows researchers to see objects on Mars that are larger than one metre (about 3 feet) in size from about 200 to 400 kilometres (about 125 to 250 miles) above. That means the pit isn’t tiny – at 50 centimetres (19.7 inches) per pixel, we’re looking at a feature hundreds of metres across. Take a look on NASA’s website for a hi-res version of the image. So the question is, did something punch its way through, or is it a collapse of some sort? Without more information, it’s hard to tell, but no doubt NASA will be discussing all of the possibilities. 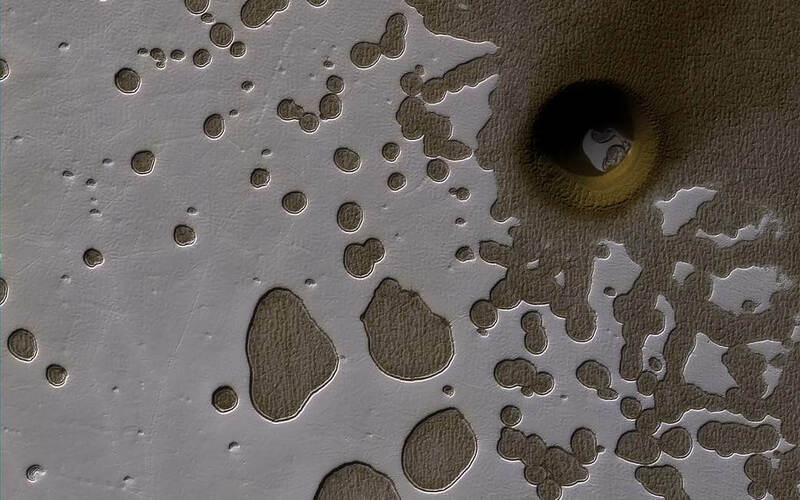 The MRO has been in Martian orbit since March, 2006, sending back detailed images of the Red Planet’s surface that reveal a dynamic environment where dust devils roam, sand dunes crawl, and occasional bits of Earthling tech are left to gather dust. After completing all of its primary goals in the first two years, and two mission extensions, the orbiter is still going strong – we’ll almost certainly be seeing more odd holes like this in the future.